KawaiiPunk - Kawaii Mascot Blog: Kawaiification! 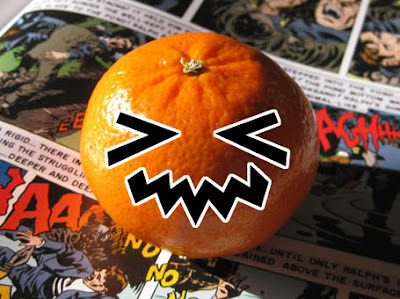 Fearsome Fruit! Yes, it’s a kawaiified orange! You see, after careful consideration I realised an orange would be a lot cuter than a pumpkin, and a lot easier to carry back from the supermarket too! Well, I am getting on a bit! Anyway, I hope you and your readers enjoy this latest work, and have a thoroughly fright filled and gruesome Halloween when the day finally arrives. Absolutely brilliant your honour! Just when I thought I’d seen it all, you come up with this! An orange over a pumpkin! Pure genius! I can’t wait to see what further surprises you have in store for us!